Rodas and Vilar (midweight) and Pantín (lightweight) are made from organic cotton raw-denim which means that it has no post-manufacturing treatment. At the begining the jeans have a rigid tact and appearance due to the starch still present in the fabric (normally the chemicals are applied to get a soft touch from the first moment). However, with little time of use this sensation disappears, the fabric becomes softer and adapts to the body. First think what you want from a pair of jeans. Then look for the option that best suits it or an intermediate point. The most important thing for Raw Denim is to wash after 3 to 6 months of use and thereafter every 1-2 months, or whatever you consider. The original tone of the raw denim will fade with the washes. Put the pants inside out. Use a mild or ecological detergent. Cold wash either by hand or short or delicate cycle. Air dry, well extended, avoiding wrinkles. We will ensure that the jeans adapt completely to the body as the starch stays longer and marks the folds and wrinkles in the precise place, which gives a much greater comfort. 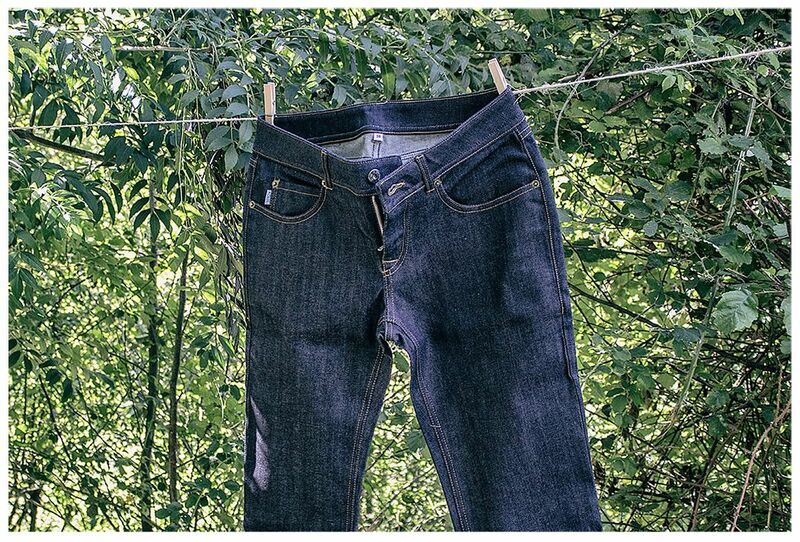 If we wear the jeans for a long time without washing them, the denim becomes brittle and can make it break faster. It may be a good idea not to put off washing for so many months if you do not mind that the contrasts are not so prominent. Iron at low temperature, max 110 degrees. 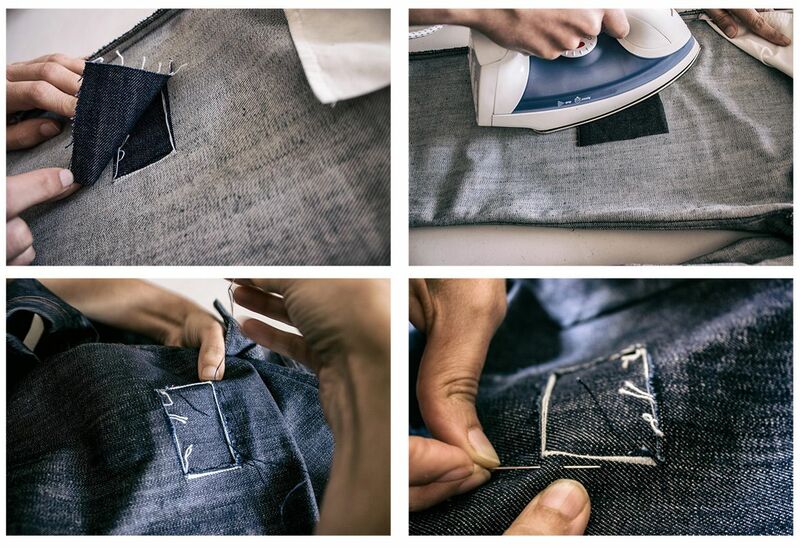 Jeans that use Raw fabrics can be washed normally. The starch is gone faster, the adaptation to the body is not maintained and the loss of color is uniform, as in the rest of the jeans. Cold machine wash at 30 degrees with dark or black clothing. Iron at low temperature, max. 110 degrees. Here are 90% of the jeans which have applied some type of treatment (or washing) after the making. In the case of our Melide models, it is ozone washing. To prevent discoloration and simultaneously save water and energy, it is preferable not to over-wash it and avoid prolonged exposure to the sun during drying. Raw denim is pure denim fabric that remains intact after dyeing, has not been manipulated with water, chemicals or machinery. This makes its manufacture more friendly to the worker and the environment besides being more durable. If we choose the raw denim care we will get the jeans completely fit the body as the starch stays longer and marks the folds and wrinkles at the precise site, which gives a much greater comfort. But it doesn’t end here… if we space the washes or delay machine washes the dark indigo is also maintained for longer, getting quite prominent fades (between the wear and original color). On the other hand, when denim is worn for a long time without washing, it becomes brittle, which makes it break faster. So we must think if we look for aesthetics or durability. Xiro clothing employs pre-shrunk or sanforized denim, ie it has been pre-treated in order to reduce the amount of shrinkage that may occur after the first wash of the jeans. The result of sanforizationn leads to only 1-2% shrinkage. Air a lot the jeans. Outdoors or near a window. Exponer al sol durante una hora por ambos lados y del revés. La radiación ultravioleta del sol reduce las bacterias. No dejar todo el día ya que la luz solar provocará un efecto antiestético. If there is any stain on our raw denim, we immediately sprinkle/wet it with a wet cloth. Never rub the stain, as rubbing will remove some of the indigo from the affected area. Put the jeans inside out on the bathtub with heavy objects on top with lukewarm water. Let the jeans soak for an hour or two in the soapy water. Drain the tub and rinse the jeans with cold water to remove soap and loose dirt. Raw denim is denim in its pure state, has not been washed or treated therefore the dye will go a little faster. To reduce it we can soak the jeans before starting to use them in a tub of lukewarm water adding ½ cup of white vinegar (Vinegar prevents colors from fading). After 1 hour rinse with cold water and dry in the air. For machine-washing select a ‘delicate’ programme with a spin cycle of 900 rpm and add ½ cup of white vinegar to the rinse cycle compartment of the washing machine. We can do it in all the washes. Make your jeans a garment with a history and extend its useful life when wear and tear takes it’s toll. We recommend: to patch, fix, customize … in short … extend the sustainable life of our garments as much as possible ?